Montgomery 17 number 359's hull was laid up in November of 1982. I don't know the full history of ownership. 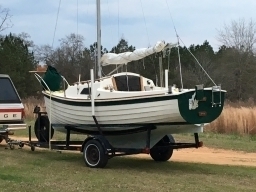 I bought her in February of 2014 and have sailed her sporadically along the Gulf ICW near Pensacola. I didn't sail her at all in 2016, and brought her home from the waterfront to do a variety of things that were needed, and some things I wanted to do to make her more comfortable for cruise camping along the Gulf ICW in the bays and lagoons from Gulfport to Appalachicola. Her sails are original McKibben sails, hank on working jib and two reef point main, which I will use this year as I evaluate getting new sails. She has been run aground pretty hard at least a couple of times, as evidenced by large chips in the leading edge of the fiberglass rudder, and by damage to the transom that was repaired without cosmetic restoration, so it was covered by a 3/4 inch board attached mid transom to which the rudder gudgeons were mounted. The steel center plate hadn't been dropped and preserved in at least five years...during mine and the previous owner's time. My projects on the boat are intended to improve her "cruisability" since I have no interest in racing and will be cruising in coastal waters over short distances. Comfort and safety under sail in this small boat are my objectives...and I want her to continue to be a good looking boat, which of course is in the eye of the beholder, with mine being the most important eye.